Estrogen Receptor-alpha (ER) drives 75% of breast cancers. Stimulation of the ER by estra-2-diol forms a transcriptionally-active chromatin-bound complex. Previous studies reported that ER binding follows a cyclical pattern. However, most studies have been limited to individual ER target genes and without replicates. Thus, the robustness and generality of ER cycling are not well understood. We present a comprehensive genome-wide analysis of the ER after activation, based on 6 replicates at 10 time-points, using our method for precise quantification of binding, Parallel-Factor ChIP-seq. In contrast to previous studies, we identified a sustained increase in affinity, alongside a class of estra-2-diol independent binding sites. Our results are corroborated by quantitative re-analysis of multiple independent studies. Our new model reconciles the conflicting studies into the ER at the TFF1 promoter and provides a detailed understanding in the context of the ER’s role as both the driver and therapeutic target of breast cancer. Breast cancer is the most common type of cancer worldwide. The hormone estrogen drives the growth of 70% of breast cancer tumors. This form of breast cancer is called estrogen receptor positive (ER+) breast cancer. In the early 2000s, several scientists found that some genes in ER+ breast cancers turn on and off in 90-minute cycles. Moreover, when the estrogen receptor binds to the DNA in the nucleus of a cell, it activates nearby genes causing the tumor cells to grow and divide. Learning more about how cancer cells respond to estrogen is very important. Many cancer drugs block estrogen to stop its tumor growth promoting effects. But the initial studies of estrogens effects were only able to look at how estrogen affected a small number of genes. Newer genome sequencing technologies allow scientists to study the effects of estrogen on more genes and provide more detailed information. Using these cutting-edge technologies, Holding et al. show that the 90-minute cycles found in the previous studies are likely artefacts of older techniques and lacking controls. The new experiments used a newer technique called parallel factor ChIP-seq to look at how all genes respond to the estrogen receptor. Then, Holding et al. reanalyzed data published in the previous studies and found that they were often contradictory and inconsistent. None of the genes – not even the ones looked at in earlier studies – were expressed in 90-minute cycles like the previous studies suggested. Instead, the expression of the genes was variable, which may make the cell even more responsive to estrogen. The previous reports of the 90-minute cycles are most likely explained by a bias of the human eye of finding patterns in a highly variable process that do not hold up to statistical analysis. Better understanding how estrogen influences genes and cell growth is essential to developing better treatments for ER+ breast cancer. This includes ruling out ideas that may be incorrect or misleading. These findings help resolve why not all studies have found estrogen receptor driven cycles of gene expression, and will provide researchers with a better foundation for future studies. The study of the Estrogen Receptor-α (ER) has played a fundamental role in both our understanding of transcription factors and cancer biology. The ER is one of a family of transcription factors called nuclear receptors. Nuclear receptors are intra-cellular and, on activation by their ligand, typically undergo dimerisation and bind to specific DNA motif (for ER: Estrogen Response Elements; EREs). On the chromatin, the nuclear receptor recruits a series of cofactors and promotes the basal transcription mechanism at either nearby promoters or through chromatin loops from distal enhancers. Because of the minimal nature of these systems relative to other signaling pathways, nuclear receptors have become a model system for transcription factor analysis. Simultaneously, the role of nuclear receptors as drivers in a range of hormone dependent cancers has led to focused studies in the context of the disease. Previously, it was reported that the ER and key cofactors followed a cyclical pattern in breast cancer cell lines with maximal binding at 45 min after stimulation with estra-2-diol (Shang et al., 2000; Métivier et al., 2003). Similar results were also reported for the AR after activation with DHT (Kang et al., 2002) and several follow-up studies exist looking at single genomic loci (Herynk et al., 2010; Luo et al., 2005; Shao et al., 2004; Burakov et al., 2002). However, subsequent genome-wide studies have provided little further detail on the specific nature of the proposed kinetics of ER binding being either limited in the number of replicates or lacking temporal resolution (Honkela et al., 2015; wa Maina et al., 2014; Dzida et al., 2017; Guertin et al., 2014). In our own network analysis (Holding et al., 2018), we focused on 0, 45 and 90 min and found no significant reduction in ER signal at 90 min. In the same study, quantitative proteomic analysis of ER interactions at the same time intervals by qPLEX-RIME (Papachristou et al., 2018) shows no significant difference in terms of ER interactions at 45 and 90 min. These conflicting results have so far not been resolved. Routinely used assays to measure protein binding to chromatin are based on Chromatin Immunoprecipitation (ChIP). 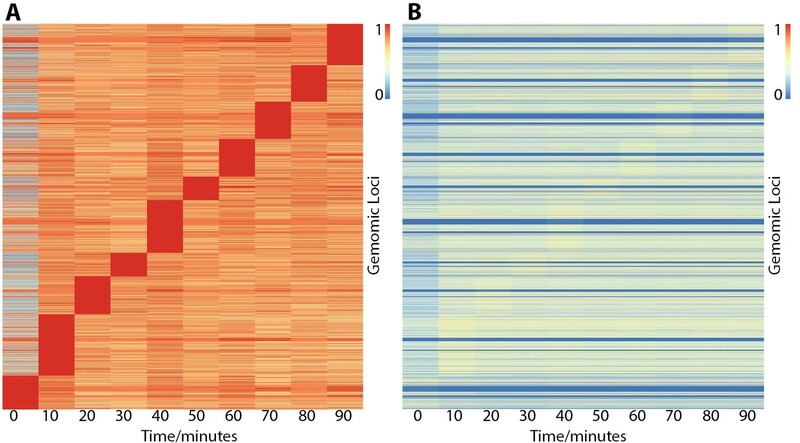 A major challenge to monitoring ER activation through ChIP is the normalization of the ChIP signal — either genome-wide with next generation sequencing or at individual loci by qPCR — as the standard protocols do not control for a significant number of confounding factors including the efficiency of the immunoprecipitation step. In the case the of the two original studies (Shang et al., 2000; Métivier et al., 2003), the data only provided limited controls in this regard. An alternative method that has been applied to normalize ChIP-seq data is to use the maximal read count obtained at each individual site across each time point (Guertin et al., 2014); however, this method is at the expense of monitoring the magnitude of ER binding and gives equal weight to low read count peaks and more robust data from stronger binding sites. In the context of these challenges, we applied two strategies to robustly and accurately monitor the process of nuclear receptor binding to chromatin on activation. The first strategy was to increase the number of replicates. We generated sample data for six independent isogenic experiments to enable better characterization of the variance within the data. This strategy provided an unprecedented level of information regarding ER activation with twice the level of replication used in previous ChIP-qPCR studies (Métivier et al., 2003) and a significant improvement on previous single replicate genome-wide studies. The second strategy was to use our recently developed method for precise quantification of binding, Parallel-Factor ChIP (pfChIP) (Guertin et al., 2018), which uses an internal control for quantitative differential ChIP-seq. Combined, these two strategies enabled us to undertake the most comprehensive and precise analysis of ER activation to date. We measured ER-binding in MCF7 cells, a widely used model system for ER biology. To maximize the reproducibility of our results, MCF7 cells were grown from ATCC stocks, keeping passaging to a minimum, and the cell line origin was confirmed by STR genotyping. Additionally, to ensure the MCF7 cell line did not show significant genetic drift during culturing within our laboratory, we applied CellStrainer (Ben-David et al., 2018) to the input data from our ChIP-seq experiments. The fraction of genome with copy-number discordance was estimated at 0.2787, within the range of 0 to 0.3 as published by CellStrainer’s developers to ensure similar therapeutic response. Sequencing reads from the analysis of 60 pfChip-seq samples targeting ER and six input samples were demultiplexed and aligned to the Homo sapiens GRCh38 reference assembly. Visual inspection of the data using the Integrative Genomics Viewer (IGV) Viewer (Robinson et al., 2011) confirmed enrichment at known ER binding sites (exemplified by TFF1 in Figure 1—figure supplement 1) and the presence of previously reported CTCF control peaks (Guertin et al., 2018). From visual inspection, pfChIP-seq samples qualitatively showed minimal ER binding at 0 min while CTCF binding was constant at all time points. Peak count data from CTCF binding sites were used to normalize between conditions as these sites have previously been shown to be unchanged in response to estrogen (Ross-Innes et al., 2011), with >70 000 binding sites discovered across all samples and >50 000 CTCF binding sites found in over 50% of samples. Analysis after normalization of the raw data showed similar levels of variability in terms of signal (Figure 1—figure supplement 2) as we saw when developing the pfChIP method (Guertin et al., 2018). The resultant normalized binding matrix of ER binding was used for all downstream analyses and is provided as Supplementary file 1. Normalized count data for the TFF1 promoter showed that on activation with estra-2-diol the ER rapidly (in less than 10 min) binds the TFF1 promoter. Binding after this time point shows no significant changes (Figure 1). Analysis of the data by individual replicates (Figure 1—figure supplement 3) did not demonstrate evidence of oscillatory binding in individual replicates either with a period of 90 min period or an alternative frequency. pfChIP-seq signal at the TFF1 promoter and proximal CTCF binding site. Binding of ER at the TFF1 promoter has been the classical focus of study before genome-wide technology and the predicted site for oscillations in ER binding. ER binding is minimal at 0 min; however, by 10 min, the ER has rapidly and robustly bound to give a sustained signal at the TFF1 promoter. In contrast, the closest CTCF binding site demonstrates a constant, estra-2-diol-independent, signal with significantly less variance. Pairwise comparison found no significant changes in binding at the TFF1 promoter (t-test, two-sided, FDR < 0.05) except for when comparing against the 0 min time point. Comparison of the variance in the ER binding after induction shows that there is significantly more variance (F-test, time points >= 10 min, p-value < 1 × 10-10) in the ER binding data than in CTCF binding between replicates. In contrast, pairwise F-test (two-sided, FDR < 0.05) for ER binding at all time points showed no significant difference in the variance for any comparison. As the variance of CTCF binding in pfChIP-seq is a good estimator of the technical variance, the most likely source of increased variance in ER binding is therefore biological. These findings were validated through analysis of the RARA promoter and proximal CTCF peaks (Figure 1—figure supplement 4), which gave consistent results to those seen at the TFF1 promoter. Previously, ER binding sites were shown to reach maximum occupancy at different time points depending on genomic location, revealing a P300 squelching mechanism at early time points (Guertin et al., 2014). Therefore, to provide a partial validation of this study, we applied the same principles of their analysis to our data, that is normalizing in the time-space setting maximum occupancy to 1. Consistent with the previous study, the two time points with the largest numbers of sites reaching maximal occupancy in both data sets were at 10 and 40 min (Figure 2A). As the remaining time points were unique to the individual data sets, these could not be directly compared. Heatmaps showing ER binding affinity from 0 to 90 min after stimulation with estra-2-diol normalized in two different ways. Row order is the same in both plots. (A) Normalized by row to time point with maximal binding. Data suggests that genomic loci may influence the time point maximal binding; however, normalizing to CTCF control peaks (B) demonstrates the effect is potentially overemphasized by normalization choice and that binding affinity is the biggest variable. In contrast, both plots (A and B) show minimal ER binding affinity is found at 0 min, consistent with the literature response of MCF7 cells to treatment of estra-2-diol. While grouping by maximum occupancy in Figure 2A was essential to highlight these features in the context of Guertin et al. 's previous study, in our analysis we found this method distorts the data and the effects that drove the appearance of blocks are not statistically significant in our dataset (Figure 2—figure supplement 1) with the exception of the 0 to 10 min contrast. As far as we are aware, the loss on ER binding on activation with estra-2-diol is unprecedented, and therefore the presence of a block of ER sites with maximal binding at 0 min warranted deeper investigation. Analysis of the class average (Figure 2—figure supplement 2A) showed that the variance of this class is much greater than the decrease seen between 0 and 10 min. A more detailed analysis of the individual trajectories of each binding site (Figure 2—figure supplement 2B) showed a similar result, with the maximal binding at time zero appearing marginal and in all cases. We therefore concluded that maintaining the group of the blocks between Figure 2A and B visually overemphasized this feature within the data. pfChIP-seq allowed us to improve on the previous study by directly normalizing the data to the internal control. The resultant binding matrix provided quantification of the absolute binding affinity at each time point (Figure 2B). Comparison of Figure 2A and B demonstrates the effects of different data normalization strategies. The relative normalization to maximum binding emphasizes binding maxima (red blocks in Figure 2A) while the absolute normalization to an internal control shows that these maxima are very shallow, barely visible in Figure 2B, and other features dominate the data. A few genes show very high levels of ER binding (visible as thin red lines in Figure 2B), while most genes show intermediate levels and some very low levels (blue lines). These different levels of ER binding are preserved over time, with only time point 0 showing very low levels for all genes. To elucidate potential different temporal responses to ER activation by estra-2-diol, we applied t-SNE (Maaten and Hinton, 2008), a widely used method for dimensionality reduction and data visualization (Figure 3). Each dot in the plot represents a binding site over time, that is one row in the binding matrix shown in Figure 2B. We colored each dot by the false discovery rate (FDR; (Benjamini and Hochberg, 1995)) for the change in ER affinity between 0 to 10 min. This analysis revealed two major trajectories of binding sites in the data, one dominated by low FDR (orange) and one by high FDR (blue). Both trajectories saw an increasing affinity in the direction of the white arrow. This pattern was stable for a wide range of perplexity, the main t-SNE parameter (Figure 3—figure supplement 1). t-SNE plot to explore temporal patterns in ER binding affinity. Two trajectories, A and B, are highlighted with white arrows and starting a single cluster of peaks. Points are colored by FDR value computed by Brundle/DiffBind for the 0 vs 10 min contrast. Trajectory A demonstrates increasing ER affinity in response to estra-2-diol at 10 min. Trajectory B shows increasing affinity for all times points, that is estra-2-diol independent binding, but the maximum signal is of a lower intensity than that of Trajectory A. De novo motif analysis for Class A (the peaks found at the end of trajectory A) gave strongest enrichment for the ERE (p = 1 × 10-538). The same analysis of Class C provided a partial ERE (not shown), consistent with ER affinity being a function of how conserved the ER binding site is with respect to ideal ERE. Analysis of Class B gave FOXA1 as the most significantly enriched motif (p = 1 × 10-19). We named the estra-2-diol responsive trajectory A, and the estra-2-diol independent trajectory B. The set of genomic sites found at the end of each trajectory were named Class A and B respectively. Motif analysis of Class A peaks demonstrated significant enrichment for the full estrogen response element (ERE, (Klein-Hitpass et al., 1986)), while Class B gave enrichment for the FOXA1 binding site. Analysis of Class C (i.e. weaker responding genes on trajectory A) gave a partial ERE match, suggesting a greater divergence from the ERE motif and consistent with the lower levels of ER affinity found on ER activation at these sites (Driscoll et al., 1998). Average binding profiles were computed for both Class A and Class B. Class A showed minimal binding at 0 min followed by a robust response before 10 min, the binding affinity then remained similar for the remaining time points. In contrast, Class B displayed estra-2-diol independent binding at 0 min and average ER binding affinity saw no significant changes between time points. Class C gave a similar profile to Class A (not shown), but with reduced amplitude. The average amplitude of the binding from 10 to 90 min displayed a greater ER affinity for Class A then Class B.
Genomic regions enrichment of annotations tool (GREAT) analysis (Welch et al., 2014) of Class B binding sites (Supplementary file 2) identified the enrichment of six amplicons previously identified from the analysis of 191 breast tumor samples, q = 5.6 × 10-41 to q = 3.3 × 10-8, (Nikolsky et al., 2008) and a set of genes upregulated in luminal-like breast cancer cell lines compared to the mesenchymal-like cell lines, q = 1.9 × 10-13, [Charafe-Jauffret et al., 2006]). Undertaking the same analysis of the ER only ChIP-seq data stream gave very similar results to that of pfChIP-seq analysis, confirming that any potential cycling is not suppressed by the method (Figure 3—figure supplement 2). As with the pfChIP-seq analysis, no clear cycling was seen for the individual replicates (Figure 3—figure supplement 2C). Class A binding sites showed the strongest response to estra-2-diol, the greatest enrichment of the estrogen response element and contained the classical ER binding site at TFF1. We therefore focused further analysis on these peaks to minimize confounding factors. A t-SNE plot of only Class A sites (Figure 4A) did not provide distinct clustering of points. Partial separation was seen on the basis of time point of maximal binding (left to right) and amplitude (approximately top to bottom). t-SNE analysis of the most strongly bound ER sites (Class A) and comparison to previously published data. (A) t-SNE plot of Class A from Figure 3, points colored by time of maximum value. Profiles for binding sites near the transcription start site of two well studied ER target genes, TFF1 and GREB1, gave a robust sustained response to estra-2-diol. Binding sites near SNX24 and ACKR3 TSS are shown to examples of ER binding affinity profiles that indicate potential early or late maximal binding. Peak coordinates are provided in Supplementary file 1. (B) Analysis of ER and cofactor binding at the TFF1 promoter in four studies (Burakov et al., 2002; Herynk et al., 2010; Shang et al., 2000; Shao et al., 2004). Data was either read directly from plots within the original publication or using ImageJ (Schneider et al., 2012) to calculate band density. To ensure data was comparable, data was normalized to the maximum value and all studies were chosen for replicating the conditions in Shang et al.’s original study. As the class profiles may average out site-specific oscillatory kinetics, we undertook analysis of individual ER binding sites. 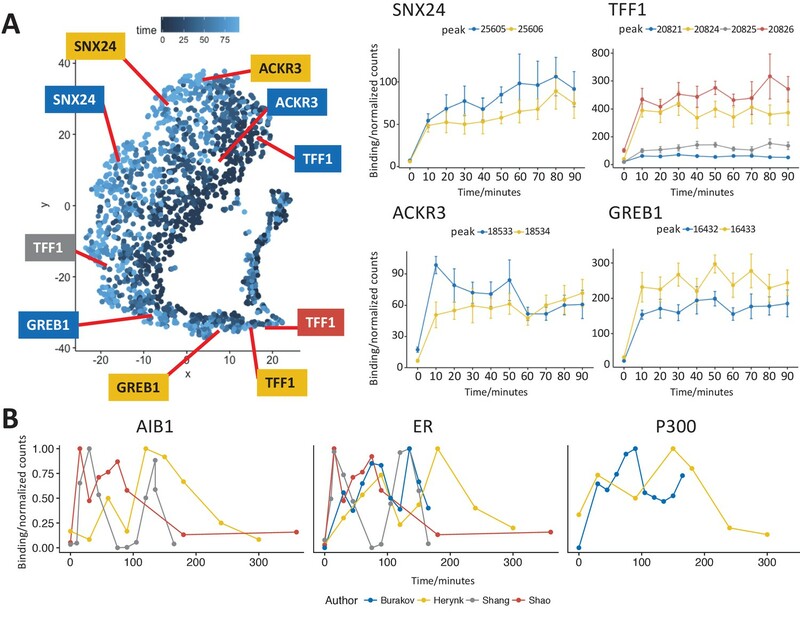 Peaks were annotated on the basis of the nearest Transcription Start Sites (TSS) and profiles for key ER target genes TFF1 and GREB1 were generated. As previously seen in Figure 1—figure supplement 1, ER binding at TFF1 was stable after induction. The same response was seen at the TFF1 enhancer (dark red). Analysis of ER binding proximal to GREB1 again showed a robust and unidirectional response to estra-2-diol. Profiles of ER binding that showed either early or late maximal ER affinity were individually investigated. Binding near the TSS of SNX24 and ACKR3 are provided as representative examples. Given we found a robust and stable response to ER activation by estra-2-diol in contrast to the cyclical response previously described (Shang et al., 2000), we reviewed studies that have investigated ER binding at the TFF1 promoter. Several studies either used a different promoter (Park et al., 2005), factor (Li et al., 2003) or estra-2-diol concentration/include α-amanitin (Métivier et al., 2003). By manually reviewing the first 1000 citations of (Shang et al., 2000), we identified several studies (Burakov et al., 2002; Herynk et al., 2010; Shao et al., 2004) that undertook the same analysis in the MCF7 cell line, with the same concentration of estra-2-diol, same crosslinking time scale, and at the same promoter as the best datasets for comparison with each other and to our dataset. Since the numerical values of ER binding occupancy were not available for these studies, we read the values off the provided charts or undertook image analysis of figures (Supplementary file 4). Comparison of the data from all four studies gave little or no consistency in the temporal profile of ER, AIB1 and P300 binding at these sites (Figure 4B). Quantitative image analysis presents limitations in reestablishing the exact values without the primary data; however, the primary data was not available. In lieu of this, analysis of the published data was considered adequate as the relative intensities will be preserved. Interpretation is further hindered as these studies only report a single replicate for analysis, thereby making it impossible to quantify uncertainty in the data. Therefore, there is no consistent evidence for cycling in the studies using the same conditions as the original observation. By undertaking six biological replicates and incorporating an internal control with pfChIP, we have produced the most comprehensive analysis to date of ER binding over the first 90 min after stimulation with estra-2-diol. We found the sites at which we detected ER binding on the chromatin follows two distinct trajectories, either the rapid activation within 10 min followed by a stable response or ligand independent binding. Enrichment of the FOXA1 motif in the strongest ligand-independent/Class B sites supports our hypothesis: that these are as a result of ER interactions at these sites. Importantly, the de novo motif analysis did not find the presence of the CTCF motif, confirming that they are not an artifact of utilizing CTCF to normalize via the pfChIP-seq method. Analysis of the Class B binding sites with GREAT (Welch et al., 2014), Supplementary file 2, gave enrichment for 6 out of 30 ER regulated amplicons identified in a previous study of 191 breast cancer tumor samples (Nikolsky et al., 2008). On the basis that no ERE was found at Class B sites and that the affinity of ER at these sites was less than at estra-2-diol response sites, we propose that these sites represent open regions of chromatin where ER can be recruited by other transcription factors in the absence of its own ligand. However, these interactions are weak, and very likely transient, as the average binding affinity for Class B sites is similar in level (a normalized read count of 30–40) to the binding before activation at Class A binding sites, but greater than Class C binding sites (≈ 10 normalized reads increasing to ≈ 40 on activation). Ligand dependent activation of ER was seen robustly at Class A sites, but displayed no evidence of cyclical binding. We propose instead that ER activation occurs rapidly, within 10 min and binding shows no significant change after this point. The two examples we demonstrated — of increasing or decreasing ER binding after activation at the SNX24 and ACKR3 TSS (Figure 4A) — should be interpreted with caution as, while downstream effects are likely to modulate ER binding, searching for individual outliers results within a large data set will generate false positives. Nonetheless, the two examples imply a secondary level of modulation does occur as previously seen, but at much lower magnitude than proposed in studies focused on ER cycling. It is possible that alternative conditions may be able to induce tightly regulated cycling; however, we feel this is unlikely in terms of physiology. For example, the work of Metivier et al. makes use of α-amanitin, a RNA polymerase inhibitor. Within the cancer biology setting, these conditions have no direct interpretation. Worse, the mode of action is downstream of the ER and therefore is a confounding factor, not a clear method of synchronization. While we cannot discount that our cells could have specifically lost the ability to regulate ER binding in the manner previously described, we have minimized this possibility through the use of cells direct from ATCC, by confirming the cell line by STR genotype and applying the latest methods (Ben-David et al., 2018) to confirm that our cell line is genetically similar to the strains used in other labs. Nonetheless, we would welcome further replication of this study. In summary, through the use of stringent internal controls, we have reproducibly shown that estra-2-diol responsive ER binding is sustained and not cyclical, with the magnitude of the binding primarily defined by the conservation of the ERE at the binding site. MCF7 cells (RRID:CVCL_0031) were obtained from ATCC and confirmed by STR genotype before culture. For each immunoprecipitation, cells from 2 × 15 cm dishes were used. In each 15 cm plate, 2 × 106 were seeded and grown for 3 days in DMEM (Glibco) with 10% FBS before washing with phosphate buffered saline. Media was replaced with charcoal stripped and phenol red-free DMEM medium. Media was replaced daily for 4 days to ensure removal of estrogenic compounds. Plates were stimulated on day 5 with a final concentration of 100 nM estra-2-diol in EtOH before crosslinking at the required time. All six replicates were done on different dates and represent different passages. MCF7 cells were obtained from ATCC. The cell line was authenticated using STR profiling and are confirmed Mycoplasma free. Parallel-factor ChIP-seq was performed as previously described (Guertin et al., 2018). CTCF antibody was D31H2 Lot:3 (RRID:AB_2086791, Cell Signaling). ER antibody was 06–965 Lot:3008172 (Millipore). Reads were aligned using BWA (Li and Durbin, 2009), and ENCODE blacklist regions (ENCODE Project Consortium et al., 2012) were removed as previously described (Carroll et al., 2014). Duplicate reads were removed and peak calling was undertaken using MACS2 (Zhang et al., 2008; Feng et al., 2012). ER and CTCF peaks were filtered according to the pfChIP-seq protocol(Guertin et al., 2018), before normalization and differential binding analysis with Brundle/DiffBind (Guertin et al., 2018; Ross-Innes et al., 2012) in R. t-SNE plots were generated with Rtsne (Krijthe, 2015). Perplexity was tested from 2 to 200 to confirm the stability of the transformation of the data into 2-dimensional space (Figure 3—figure supplement 1). Lower perplexities, 2 and 5, gave minimal structure. For perplexities tested between 30 and 200, two stable trajectories were seen in all cases. GREAT (Welch et al., 2014) was used to analyze Class B binding sites. Band intensities from previously published studies were measured with ImageJ (Schneider et al., 2012). Sequencing data have been deposited in GEO under accession code GSE119057. Journal of Biological Chemistry 277:14359–14362. Journal of Biological Chemistry 273:29321–29330. Breast Cancer Research and Treatment 122:381–393. Journal of Biological Chemistry 277:48366–48371. Rtsne: T-Distributed Stochastic Neighbor Embedding using Barnes-Hut Implementation, https://github.com/jkrijthe/Rtsne. Annual Review of Biophysics 45:25–47. Molecular and Cellular Biology 23:3763–3773. Molecular and Cellular Biology 25:7386–7398. Journal of Machine Learning Research 9:2579–2605. Thank you for sending your article entitled "Genome-wide Estrogen Receptor-α activation is sustained, not cyclical" for peer review at eLife. Your article is being evaluated by Jessica Tyler as the Senior Editor, a Reviewing Editor, and three reviewers. The existence of oestrogen receptor cycling has become a debated matter in recent years. Previously it was shown that ERa and its cofactors bind to response elements in a co-ordinated cyclical fashion, but recent data has questioned these findings. In this study, Holding et al., have performed a high number of replicates and included a number of controls as well as a new normalization protocol to demonstrate that ERa binds to DNA rapidly and remains bound, rather than cycling on and off of DNA. If substantiated, this would be an important addition to the understanding of ER biology and regulation. However, substantial criticisms have been raised by several referees around whether cycling indeed does not occur that would need to be addressed in detail. 1) The authors normalised the ER ChIP-seq data over CTCF ChIP-seq data, aiming to minimise noise in the analyses. The authors claim that other papers that have described a cyclic behaviour of ER are describing an artefact due to low sample numbers and noisy data. However, the current dataset is quite heavily pre-processed, rendering it impossible to assess whether the hypothesis is correct (cyclic ER pattern, due to noise). The authors should visualise and use the individual datastreams (ER ChIP-seq, CTCF ChIP-seq) and determine whether the ER ChIP-seq data alone would have the cyclic behaviour, or that individual replicates may have that. I find this a key issue. 2) The paper is quite strongly TFF1-focussed, while full genome ER ChIP-seq data is available. With that, I believe the study should be re-positioned, making use of the actual genome-wide information instead. 3) Figure 1: The authors conclude that the data does "not demonstrate evidence of oscillatory binding…" while noting, "there is significantly more variance (F-test, time points >= 10 minutes, p-value < 1 × 10−10) in the ER binding data than in CTCF binding between replicates." However, even allowing for this, as seen in Figure 1, there does appear to be cyclical, dynamic changes in ER binding, particularly when compared to the profile seen for the CTCF control, which appears to be relatively constant. The pattern suggests low ER binding at 20,40 and 60 minutes, and higher binding at 30, 50 and 70 minutes. While not pronounced, this pattern appears to have been lost following analysis. Related to this, is CTCF a good control in this setup? ER and CTCF have been described to cooperate (Ross-Innes et al., 2011). With a biological and functional connection between both proteins, is it really justified to use CTCF to normalise ER data? 4) Over time, some replicates are substantially more variable at specific time points as compared to others, e.g. Figure 1—figure supplement 4 (20, 40, 70, 90 minutes highly variable, while 10, 30, 80 minutes have hardly any variation). Wouldn't this actually support a cyclic patterns in the data? Why would specific time points have a larger variation than others? 5) Figure 2: In addition to the general increase in binding across all sites in response to E2, Part A shows blocks of distinct high affinity ER binding sites that change during the time course. These blocks can still be seen when normalized for CTCF binding, as seen in Part B. The significance of these blocks, particularly in relation to their appearance during the time-course are not adequately discussed. Figure 2: In addition to the general increase in binding across all sites in response to E2, Part A shows examples of binding sites which appear to exhibit cyclical binding ER in the time-course. These can still be seen when normalized for CTCF binding, as seen in Part B, although, these are difficult to see here, as the normalization appears to dampen the dynamic range for ER binding. The significance of these sites particularly as regards the overall conclusions of the paper are not adequately discussed. 6) I am concerned with the analyses carried in subsection "Quantitative re analysis of independent studies", some of which relies on image analysis of published figures. Unless these analyses were carried out on the primary image data, I would not expect this to be a reliable approach. Also, as the authors themselves point out, there are notable differences in the way the time-course experiments have been carried out in the current study, when compared to the older studies considered in this section. Related to this, In the work by Metivier et al., (2003), the group used α-amanitin to synchronise the cells and strip ERa from response elements. This harsher synchronisation of the cells may result in a clearer cycling of ERa. To be able to compare the data presented here to this previous work, I feel that it will be necessary to perform a ChIP time course for the TFF1 promoter +/- α-amanitin to see if this explains the difference in results. In the field of Estrogen Receptor genomics, an often-reported phenomenon is that ER is cycling on the genome upon E2 stimulation. The authors now claim this is not the case, and the original observations may be related to lower number of replicates and noise in the analyses. Even though this is a compelling concept, I am personally not convinced this is the case, based on the data that are being presented in this manuscript. 3) Is CTCF a good control in this setup? ER and CTCF have been described to cooperate (Ross-Innes et al., 2011). With a biological and functional connection between both proteins, is it really justified to use CTCF to normalise ER data? 4) Over time, some replicates are substantially more variable at specific time points as compared to others, e.g. Figure 1—figure supplement 4 (20, 40, 70, 90 minutes highly variable, while 10, 30, 80 minutes have hardly any variation). Wouldn't this actually support a cyclic pattern in the data? Why would specific time points have a larger variation than others? The existence of oestrogen receptor cycling has become a debated matter in recent years. Previously it was shown that ERa and its cofactors bind to response elements in a co-ordinated cyclical fashion, but recent data has questioned these findings. In this study, Holding et al., have performed a high number of replicates and included a number of controls to demonstrate that ERa binds to DNA rapidly and remains bound, rather than cycling on and off of DNA. This is important because it furthers our understanding of how nuclear receptors, such as ERa, regulate target gene expression. The paper is generally sound, but I have one main concern. In the work by Metivier et al., (2003), the group used α-amanitin to synchronise the cells and strip ERa from response elements. This harsher synchronisation of the cells may result in a clearer cycling of ERa. To be able to compare the data presented here to this previous work, I feel that it will be necessary to perform a ChIP time course for the TFF1 promoter +/- α-amanitin to see if this explains the difference in results. The interaction of transcripiton factors with DNA and chromatin are considered to be highly dynamic. This conclusion has been supported by numerous studies, including studies examining nuclear receptor dynamics, such as those previously carried out for Estrogen Receptor α (ER). Both direct evaluation of ER binding by Chromatin Immunopreciptation (ChIP) methods and imaging in live cells have supported a paradigm of rapid and continuous exchange events with the DNA. These highly dynamic interactions are a property of both DNA-protein and protein- protein interactions and are inherent to the transcriptional response. The paper by Holden et al. seeks to use ChIPseq analysis for the estrogen receptor, in the MCF7 estrogen responsive breast cancer cell line, in order to further investigate ER transcriptional dynamics. Their analysis has used a parallel factor ChIP (pfChIP) normalization methodology, recently published by the lead author. Using this analysis, the authors observe that, rather than cycling at binding sites, a sustained increase in binding (affinity) is seen, together with a class of estrogen (E2) independent binding sites. 1) Figure 1: The authors conclude that the data does "not demonstrate evidence of oscillatory binding…" while noting, "there is significantly more variance (F-test, time points >= 10 minutes, p-value < 1 × 10−10) in the ER binding data than in CTCF binding between replicates." However, even allowing for this, as seen in Figure 1, there does appear to be cyclical, dynamic changes in ER binding, particularly when compared to the profile seen for the CTCF control, which appears to be relatively constant. The pattern suggests low ER binding at 20,40 and 60 minutes, and higher binding at 30, 50 and 70 minutes. While not pronounced, this pattern appears to have been lost following analysis. 2) Figure 2: In addition to the general increase in binding across all sites in response to E2, Part A shows blocks of distinct high affinity ER binding sites that change during the time course. These blocks can still be seen when normalized for CTCF binding, as seen in Part B. The significance of these blocks, particularly in relation to their appearance during the time-course are not adequately discussed. 3) Figure 2: In addition to the general increase in binding across all sites in response to E2, Part A shows examples of binding sites which appear to exhibit cyclical binding ER in the time-course. These can still be seen when normalized for CTCF binding, as seen in Part B, although, these are difficult to see here, as the normalization appears to dampen the dynamic range for ER binding. The significance of these sites particularly as regards the overall conclusions of the paper are not adequately discussed. 4) I am concerned with the analyses carried in subsection "Quantitative re analysis of independent studies", some of which relies on image analysis of published figures. Unless these analyses were carried out on the primary image data, I would not expect this to be a reliable approach. Also, as the authors themselves point out, there are notable differences in the way the time-course experiments have been carried out in the current study, when compared to the older studies considered in this section. We thank you for highlighting this point. While we feel the pfChIP-seq is the most reliable method for analysing the data as it controls for IP efficiency, nonetheless presenting it alongside a more classic analysis clearly strengthens the manuscript. We have re-analysed the data using only the ER ChIP-seq data stream and found no significant differences in the results. These data are now provided in Supplementary file 5 and Supplementary file 6 and the analysis is in the Rmarkdown. Before interpreting, we would draw the attention of the reviewers to our analysis in responses 3 and 4 which discuss the significance of the variation of the mean in both plots. Our analysis of the ER data stream in the same manner as the complete pfChIP-seq data demonstrates little difference between the two and confirms that pfChIP-seq is not masking that possibility of a regulated oscillation in ER binding. Rather, it ensures that the variance is not caused by changes in IP efficiency. 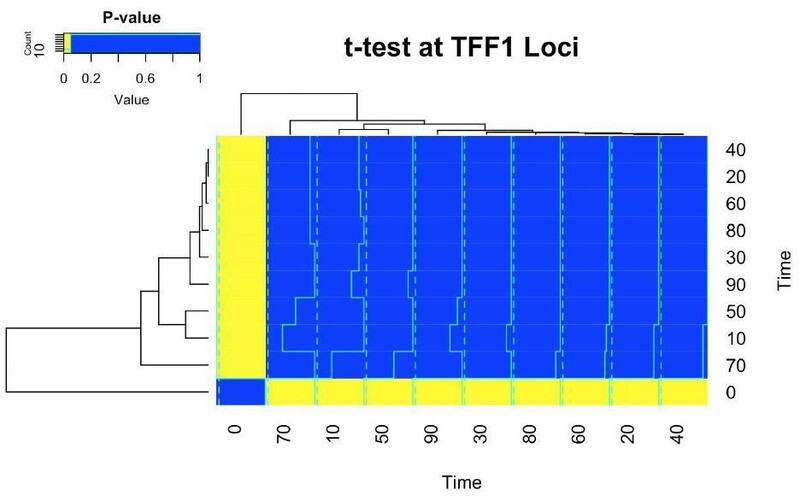 As a result, we are confident that there is no consistent cycling in the individual replicates or at individual sites (illustrated in Panel C for TFF1, and genome wide in panel D). We have added the following to the text to highlight this result and the figure below as Figure 3—figure supplement 2. We introduce the paper with TFF1 as it is the classical ER target gene and the most studied within the literature. As a result, it forms the basis of Figure 1 alongside a supplemental figure for the RARA loci. We do not feel that this makes the paper ‘strongly focused on TFF1’. To the contrary, three-quarters of the manuscript figures are already focused on genome-wide analysis and only 5% of the paper’s text (~180 words) forms the section “ER Binding at the TFF1 Promoter”. Outside this section, the word ‘TFF1’ is only mentioned 6 times. This includes a mention in the abstract, essential given the gene’s importance to the field, and in the section “Quantitative re-analysis of independent studies”. Figure 2 is genome-wide and compared to public genome-wide data. Figure 3 and Figure 4 present genome-wide information and the final discussion is also focused on the genome-wide results (and does not mention TFF1 at all). In meeting the other request of reviewers, we have specifically been asked to further analyse the TFF1 promoter data, e.g. point 3 below, and have therefore had to include more on this topic. Even with these additional analyses, the paper is strongly focused on genome-wide results and not on individual loci. 3a) Figure 1: The authors conclude that the data does "not demonstrate evidence of oscillatory binding…" while noting, "there is significantly more variance (F-test, time points >= 10 minutes, p-value < 1 × 10−10) in the ER binding data than in CTCF binding between replicates." However, even allowing for this, as seen in Figure 1, there does appear to be cyclical, dynamic changes in ER binding, particularly when compared to the profile seen for the CTCF control, which appears to be relatively constant. The pattern suggests low ER binding at 20,40 and 60 minutes, and higher binding at 30, 50 and 70 minutes. While not pronounced, this pattern appears to have been lost following analysis. Residual variability in the estimate of the mean is the expected result for a n=6 experiment with this level of variance. Patterns visible by eye are inevitable and need to be rigorously tested. We find that none of the apparent patterns are statistically significant, as shown by the plot below, with the exception of the comparison between 0 minutes and other time points, which is significant at p < 0.05, and represents the sustained activation of the ER. There is the possibility of a weaker modulation of the signal that we do not have the statistical power to see; however, the timings the reviewer proposes would suggest a completely novel behaviour that has not been described before. There is no statistical evidence for the reviewer’s claim nor does it fit the classical description of cyclical ER binding which we are disputing (maximal binding at 45 minutes, no binding at 90 minutes). We believe our proposal – that the apparent binding dynamics are a result of noise – is superior, as it integrates all previous work and provides a model that fits with the literature. b) Related to this, is CTCF a good control in this setup? ER and CTCF have been described to cooperate (Ross-Innes et al., 2011). With a biological and functional connection between both proteins, is it really justified to use CTCF to normalise ER data? Thank you for raising this key point. A good choice of the control factor is critical and should be justified. This experiment was undertaken with 6 replicates, i.e. n=6. While this is much higher than almost all ChIP-seq experiments in the literature, it is still not a large value of n in terms of statistics. When estimating the mean and variance of the population, which is what we are actual plotting in a box plot, the accuracy of estimating the variance is more susceptible to low n than the mean. Therefore, we would expect each time point to have a different estimate for the variance if the data is noisy and n is relatively small. This is true even if the means are similar. We believe the challenge is that the eye is very much drawn to finding patterns, even if those patterns occur by chance, which is exactly what happens when sampling 6 data points from an underlying distribution. Therefore, to robustly address your concerns, we undertook an F-test between every time point (Figure 1). 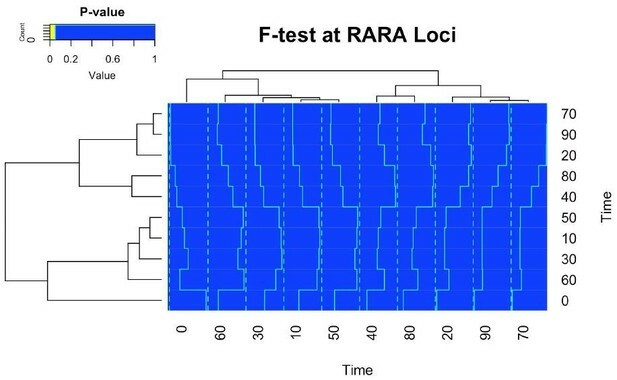 We found no significant difference in variance (heatmap below, left), implying that the changes in variance can be explained by the sampling process of a n=6 experiment. 5a) Figure 2: In addition to the general increase in binding across all sites in response to E2, Part A shows blocks of distinct high affinity ER binding sites that change during the time course. These blocks can still be seen when normalized for CTCF binding, as seen in Part B. The significance of these blocks, particularly in relation to their appearance during the time-course are not adequately discussed. b) Figure 2: In addition to the general increase in binding across all sites in response to E2, Part A shows examples of binding sites which appear to exhibit cyclical binding ER in the time-course. These can still be seen when normalized for CTCF binding, as seen in Part B, although, these are difficult to see here, as the normalization appears to dampen the dynamic range for ER binding. The significance of these sites particularly as regards the overall conclusions of the paper are not adequately discussed. We thank the reviewers for highlighting these peaks. However, it should be noted that Figure 2A is much more aggressively normalised and results in considerable distortion of the data compared to Part B, not less. We therefore have added the following to the manuscript. 6a) I am concerned with the analyses carried in the section "Quantitative re analysis of independent studies", some of which relies on image analysis of published figures. Unless these analyses were carried out on the primary image data, I would not expect this to be a reliable approach. A) The aim of the original figure was to accurately represent the data, and this is the only form it was reported in. Therefore, information can be gained from analysing these images. B) The images do not to appear to be significantly altered for contrast. While contrast editing is possible, our argument is based on the relative magnitude between time points, which will not change on increasing contrast. C) The most likely effects of image analysis is a loss of dynamic range or oversaturation. These effects would broaden the peak of any cycling event and would not affect our conclusion. We see no correlation in the timing of binding events at all. Our analysis makes the best of previously published results, rather than disregarding them as useless. By using a quantitative analysis of the published image, we have taken an unbiased approach and darker bands clearly provide more signal when our graph is compared to the original studies. As none of the events previously reported correlate, even on a qualitative level, we believe this is an important part of the study and we have been completely honest on our methods. To reiterate, the alternative is to discount all previous work, which we believe would find less support. b) Also, as the authors themselves point out, there are notable differences in the way the time-course experiments have been carried out in the current study, when compared to the older studies considered in this section. c) Related to this, In the work by Metivier et al., (2003), the group used α-amanitin to synchronise the cells and strip ERa from response elements. This harsher synchronisation of the cells may result in a clearer cycling of ERa. To be able to compare the data presented here to this previous work, I feel that it will be necessary to perform a ChIP time course for the TFF1 promoter +/- α-amanitin to see if this explains the difference in results. Exactly for the reasons the reviewer expressed in point 6b, we chose not to use α-amanitin. Few studies beyond those of Metivier and his co-workers have made use of these conditions. From a cancer biology point of view, the effects of α-amanitin, which is deadly to organisms (LD 50 0.1mg/kg), has no physiological interpretation. Further, α-amanitin blocks the polymerase which is downstream of the estrogen receptor. There is no reason to believe that it directly impacts the ER and our study does not look at RNA synthesis. Additionally, α-amanitin does not provide a mechanism to synchronise cell cycle progression. It will only at best halt the cell in the phase it is in. Estrogen starvation for multiple days has the same result, causing MCF7 (and other ER+ cancer models) cells to stop cell division. 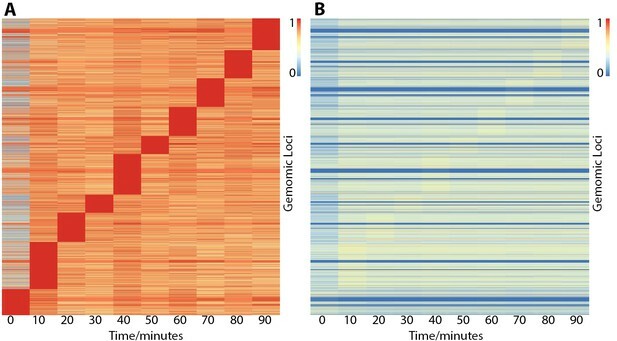 Synchronisation has clearly occurred as the 0-10 minute response to E2 is conversed genome-wide and between replicates. One solution to these challenges is single molecule imaging strategies, as used by the Gordon Hager Lab. Gordon Hager has long maintained that the ER cycling model is not supported by his work and is clearly incompatible with the results he has presented. This contradiction is described by Lenstra et al., (2016). In contrast, our model is compatible with the work of the Hager Lab. Therefore, while we accept that our study does not rule out that α-amanitin may cause the effects seen in Metiever’s manuscript, we can rule out that this does not occur in more physiological conclusions and that our results best fit with the wider literature. Experimental Design, Sample Preparation and Data Analysis, ANH. Sample Preparation, AEC. Manuscript preparation ANH, AEC and FM. We thank the CRUK Genomics Core for undertaking the library preparation and sequencing. © 2018, Holding et al. Listen to Andrew Holding explain why estrogen response in breast cancer cells is not cyclical, as previously suggested. Estrogen response in breast cancer cells is not cyclical, as previously thought.